The World's Most Amazing, Extremely Concentrated Preworkout! PRE-FO Before I Lift More! It increases energy levels by removing ammonia from the body, allowing you to train harder and for longer periods of time. Who Is In Need of Magnum PRE-FO? Anyone who is a competitive physique athlete. Anyone wanting to ramp up their training. Anyone who likes more energy but also wants to feel good all day post training. Anyone who tried an inferior, basic preworkout product and hated how it made them feel. 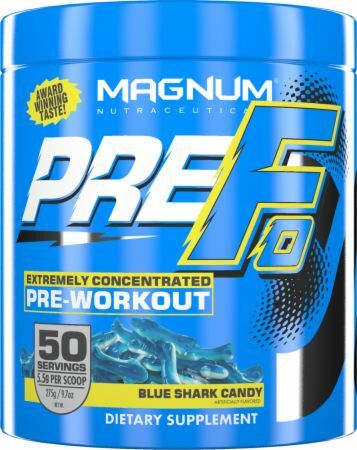 Natural & Artificial Blue Sharks Candy Flavor, Sodium Bicarbonate, Tricalcium Phosphate, Sucralose. Directions For PreFo: Mix 1 scoop in 250ml (8oz) of water and consume 15-30 minutes before training. Store in freezer after opening. Warnings: Consult a health care practitioner prior to use if you are following a low protein diet, are taking lithium, Levodopa, nitrates, or medication to treat erectile dysfunction; or if you have liver or kidney disorder, epilepsy, high blood pressure, glaucoma and/ or detrusor instability (overactive bladder syndrome). Consumption with natural health products (e.g.bitter orange extract, synephrine, octopamine, ephedra) which increase blood pressure, or other caffeine containing products (e.g. medications, coffee, tea, colas, guarana, mate) is not recommended. This product is not intended as a substitute for sleep. Consult a health practitioner prior to use if you are of child bearing age, have cardiovascular disease or hypertension, diabetes, prostate disorders, or are taking prescription medications. Do not use if you are pregnant, breastfeeding, of if you are taking blood pressure medications (either hypertensive or antihypertensive), thyroid medications, sympathomimetic, monoamine oxidase inhibitors (MAOIs), decongestant-containing cold preparations (i.e. phenylephrine or pseudoephedrine), products containing ephedra or ephedrine, or other medications which increase blood pressure. May cause paresthesia (pins and needles), headaches, nausea, gastrointestinal discomfort, palpitations and diarrhea. Hypersensitive/ allergy is known to occur, in which case, discontinue use. May result in weight gain. For occasional use only. NOT FOR CHILDREN. To avoid clumping & hardening, place in freezer after opening.